Name Variation Anna Vavruska was also known as Annie. Married Name Her married name was Petranek. Anna Vavruska was born in January 1881 at South Dakota. She was the daughter of Frantisek Vavruska and Frances Pesa. [S245] U.S. Federal Census 1900 U.S. Federal Census, by Ancestry.com, ED25. Dwelling 55. Married Name Her married name was Fridrich. Amelia Vavruska was the daughter of Frantisek Vavruska and Frances Pesa. Married Name 7 February 1893 As of 7 February 1893,her married name was Varuska. Married Name 7 February 1893 As of 7 February 1893,her married name was Vavruska. Anna Slama was born in 1875 at Dakota Territory. She was the daughter of Anton Slama and Anna Dostal. Anna Slama married Joseph Vavruska, son of Frantisek Vavruska and Frances Pesa, on 7 February 1893. Anna Slama died on 11 November 1963. [S246] U.S. Federal Census 1880 U.S. Federal Census, by Ancestry.com, NA Film Number T9-0111 Page Number 113A. Anton Slama was born in 1838 at Bohemia. He married Anna Dostal in 1869. Married Name 1869 As of 1869,her married name was Slama. Anna Dostal was born in 1842 at Bohemia. She married Anton Slama in 1869. Adolph Slama was born after June 1880. He was the son of Anton Slama and Anna Dostal. Joseph Slama was born circa 1878 at Dakota Territory. Anton Slama was born circa 1871 at Bohemia. Anton Slama died before 1900. Frank Slama was born circa 1874 at Dakota Territory. Frank Slama died before 1900. Josie Slama was born circa January 1880 at Dakota Territory. Josie Slama died before 1900. 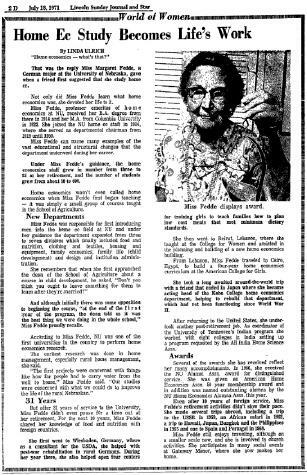 Name Variation Nancy Addie Fee was also known as Adeline Nancy. Married Name 1900 As of 1900,her married name was Fedde. Nancy Addie Fee was born on 31 August 1877. She married Christian Fedde Jr., son of Christian J. Fedde Sr. and Margaret Glandt, in 1900. 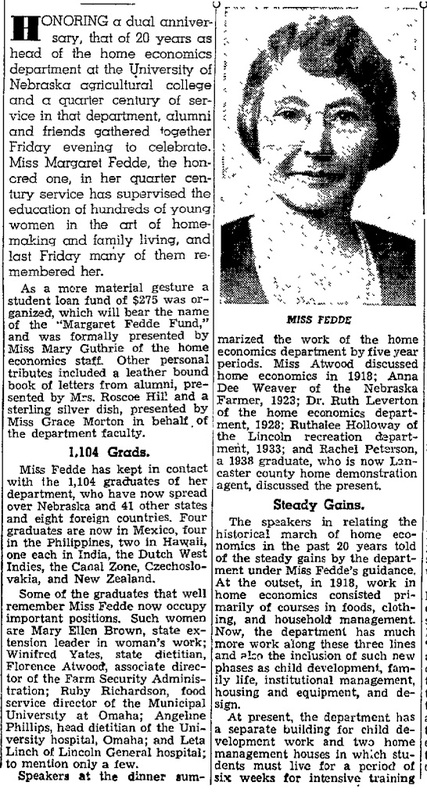 Nancy Addie Fee died on 11 August 1958 at Omaha, Nebraska, at age 80. 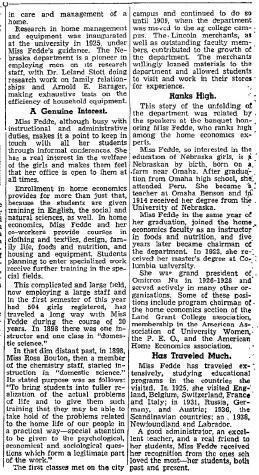 Margaret S. Fedde was born on 15 October 1883 at Union, Douglas, Nebraska. She was the daughter of Christian J. Fedde Sr. and Margaret Glandt. 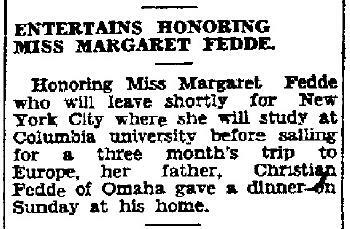 Margaret S. Fedde died in October 1978 at Lincoln, Lancaster, Nebraska. 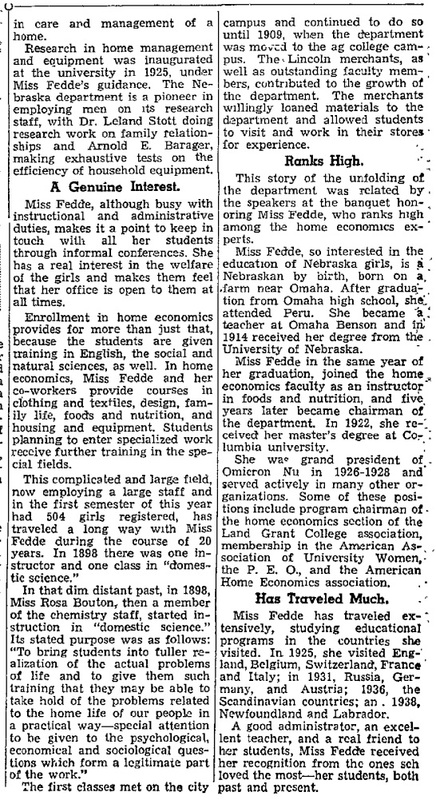 FEDDE, MARGARET: Chairman Home Economics Department; b near Irvington, Neb; d of Christian Fedde-Margaretha Glandt; ed Omaha Central HS; PSTC 1907; U of N, BA 1914; Columbia U, MA 1922; grad work Chicago U, & U of Cal, Berkeley; Delta Delta Delta; Omicron Nu, natl pres 1926-28; Phi Upsilon Omicron; Alpha Lambda Delta; Mortar Board; 1907-08 tchr, Douglas Co; 1908-12 grade & HS tchr, Benson; 1914-19 instr & head of food & nutrition div, dept of home economics, U of N Coll of Agr; 1919- chmn home economics dept, U of N; coauthor A Study of Farm Families & Their Standards of Living in Selected Dists of Neb, bulletin 78, 1931-33; during World War dietitian SATC boys hospitalized at U of N, also tchr adult classes on conservation of foods; secy Home Economics section of Assn of Land Grant Colls & Unis; AAUP; AAUW: Amer Home Economics Assn; mbr advisory bd U of N YWCA, past chmn; League of Women Voters; PEO; Congl Ch; Indep; hobbies, golf, reading, travel, visited Europe 1925, Russia 1931, Scandinavian Countries 1936; off U of N, Home Economics Bldg; res 3241 Holdrege, Lincoln. 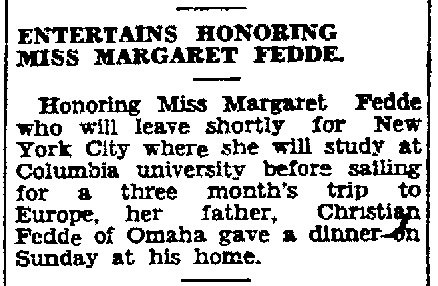 In December 1930 at Omaha, Nebraska, Christian Fedde hosted dinner for daughter Margaret before leaving for NYC and 3 month trip to Europe. 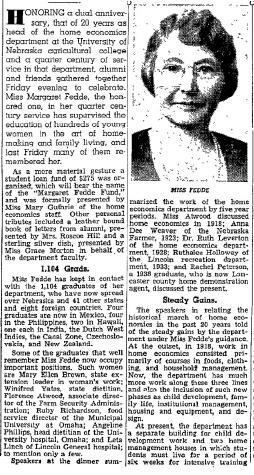 In February 1939 at Nebraska Miss Margaret Fedde of University of Nebraska home economics department honored for 25 years of service. 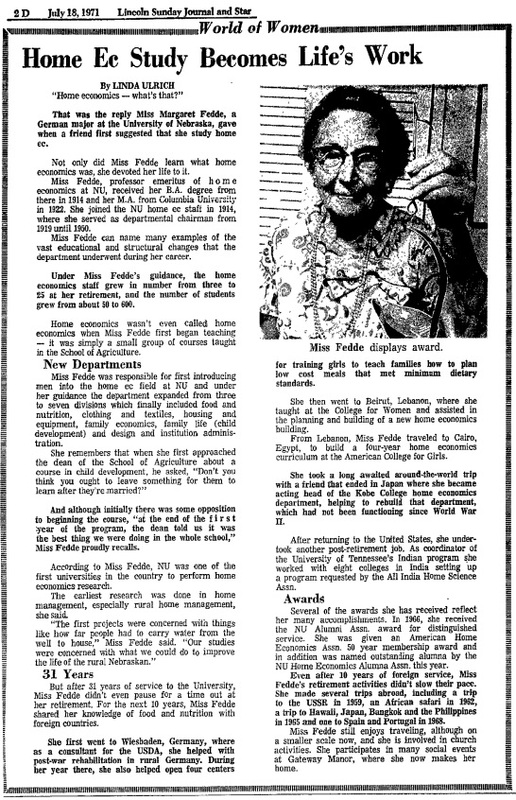 In July 1971 at Nebraska Miss Margaret Fedde profile article. [S245] U.S. Federal Census 1900 U.S. Federal Census, by Ancestry.com, Year: 1900; Census Place: Union, Douglas, Nebraska; Roll: 926; Page: 8B; Enumeration District: 0113; FHL microfilm: 1240926. Married Name Her married name was Buller. Nancy A. Fedde married Henry Buller. Nancy A. Fedde was born in November 1885 at Douglas, Douglas, Nebraska. Nancy A. Fedde died in October 1959 at age 73. Henry Buller married Nancy A. Fedde, daughter of Christian J. Fedde Sr. and Margaret Glandt. Henry Buller was born circa 1879. Herbert Buller was born circa 1908. He was the son of Henry Buller and Nancy A. Fedde. Ruby Buller was born circa 1911. She was the daughter of Henry Buller and Nancy A. Fedde. Name Variation Harry Fedde was also known as Rymer Harry. Harry Fedde married Anna Steffen. Harry Fedde was born on 18 December 1887 at Douglas, Douglas, Nebraska. He was the son of Christian J. Fedde Sr. and Margaret Glandt. Harry Fedde died in August 1976 at Blair, Washington, Nebraska, at age 88. Anna Steffen married Harry Fedde, son of Christian J. Fedde Sr. and Margaret Glandt. Anna Steffen was born circa 1887. Rymer H. Fedde was born on 19 January 1915. He was the son of Harry Fedde and Anna Steffen. Rymer H. Fedde died on 13 August 1997 at age 82. Rymer H. Fedde obtained US Social Security Card at Nebraska; last residence Bennington, Douglas, Nebraska. 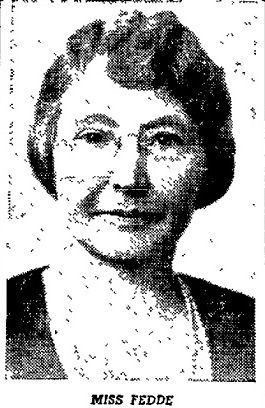 Erma D. Fedde was born circa 1913. She was the daughter of Harry Fedde and Anna Steffen. Name Variation Lozene Margaretha Fedde was also known as Lorene. Married Name Her married name was Neuhaus. Lozene Margaretha Fedde married (?) Neuhaus. Lozene Margaretha Fedde was born on 9 March 1910. Victor Hajek married Anna Urbanovsky. Victor Hajek was born on 21 August 1904. Married Name Her married name was Hajek. Anna Urbanovsky married Victor Hajek. Anna Urbanovsky was born on 11 July 1905. Dorothea Flados was born circa 1917 at Texas. She was the daughter of Ole Ludwig Flados and Una Missouri Flournoy. Dorothea Flados died before 2006. Name Variation Anna Roe was also known as Rowe. Married Name after 1880 As of after 1880,her married name was Crotchett. Anna Roe was born circa 1862 at Kentucky. She married James S. Crotchett, son of Stephen Coe Crotchett and Margaret Rodgers, after 1880. Anna Roe died before 1900. Name Variation Felix Emery Crotchett was also known as Emery. Felix Emery Crotchett was born on 27 April 1891 at Kentucky also reported as Apr 1890. Felix Emery Crotchett married Ada Catherine Hall on 19 October 1911 at Golconda, Pope, Illinois. Felix Emery Crotchett died on 28 March 1925 at Tucson, Pima, Arizona, at age 33. Married Name 19 October 1911 As of 19 October 1911,her married name was Crotchett. Married Name after March 1925 As of after March 1925,her married name was Langdon. Ada Catherine Hall was born on 27 December 1893 at Smithland, Livingston, Kentucky. She married Felix Emery Crotchett, son of James S. Crotchett and Anna Roe, on 19 October 1911 at Golconda, Pope, Illinois. Ada Catherine Hall died on 12 October 1974 at Jeffersonville, Indiana, at age 80. Edna Mae Crotchett was born in 1917 at Kentucky. She was the daughter of Felix Emery Crotchett and Ada Catherine Hall. Edna Mae Crotchett died in 2002 at Utah. Name Variation Etna Mae Crotchett was also known as Edna Mae. Etna Mae Crotchett was born in February 1882 at Kentucky. Dudley Crotchett was born circa 1893.